Embellished with sequin, beads, thread and lace work these embroidered wedding lehenga and ghagras are in line with the latest fashion.Designers try to excel for one another so they bring their best asset on surface this thread work lehengas are extremely the evidence of designer’s endeavor nature. Light pink thread lehenga is looking fresh and bright in white and light skin thread embroidery. Mirrors have been studded on this beautiful piece of lehenga along with thread work. Thread work has been done minutely that color of cloth is difficult to see in this weighty thread work. We design this bridal Lehenga with heavy embroidery, which makes it very striking and elegant. 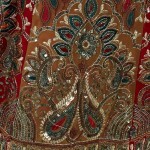 Expensive looking bead works bridal lehengas.